This blog post was originally published by Patrick Blessinger as an article on University World News – you can access it here. Open Education: International Perspectives in Higher Education can be read and downloaded for free here. Open education is the policy and practice of broadening access to allow greater participation in lifelong learning and tertiary education. It is based on the principle that everyone has a right to benefit from educational resources. The term ‘open’ is a term that implies the reduction or elimination of barriers (cost, distance, access) that allows for greater participation in high-quality educational processes, and ideally, the re-use and re-purposing of educational resources. Thus, the two main criteria of open education are that they are open and free. 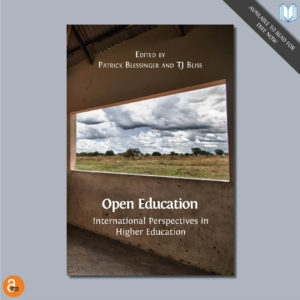 TJ Bliss and I, together with several educational scholars from around the world, examine these and other issues in the book, Open Education: International perspectives in higher education. In the modern era, the Printing Revolution marked the first major step towards democratising knowledge and enabling mass learning. The widespread usefulness of the printing press was to the 15th century what the public library was to the 19th century. Although libraries of all types have existed for centuries, the first modern (ubiquitous, free, open access) public library system can trace its roots to the Public Libraries Act of 1850 in England, which enabled communities greater than 10,000 residents to establish local libraries. The idea of public funding of libraries (that is, access to knowledge as a right) began to spread throughout the world. Thus, the library system has been a major catalyst in the democratisation of knowledge and in the development of democracy, especially during the late 19th and early 20th centuries. From the late 20th century to the present, libraries have become increasingly digitised to improve collection, storage, dissemination and access to knowledge. Since democracy is a system of self-governance where governance is justified by consent of the governed, it follows that the health and strength of any democratic system depends on an educated and well informed society. As societies become more complex and more interconnected, educational systems must also become more inclusive and multifaceted to adapt to ongoing changes. The Industrial and Democratic Revolutions of the late 18th century marked a turning point in the progress of humanity. Before these events, education at all levels was viewed as a privilege and as the responsibility of families and religious institutions. However, after the effects of Industrial and Democratic Revolutions began to become widespread, more societies started to view universal basic education as a right, as a socio-economic necessity and as a public responsibility. Thus, publicly supported schools (just like publicly supported libraries) gradually became more pervasive and eventually universal. With the growth of publicly supported libraries and schools, education was no longer the exclusive province of the privileged and powerful. As a result, universal education helped create a virtuous cycle of democratic development: democracy tends to lead to more education, which tends to lead to stronger democracy. The right to education (at all levels) is now firmly established in universal declarations and international laws. For instance, the right to education is recognised in the Universal Declaration of Human Rights and the International Covenant on Economic, Social and Cultural Rights. The open education movement is part of the wider movement to democratise knowledge, and to democratise tertiary education in particular, and to treat lifelong learning as a human right. The idea of open education is also part of the movement to create a culture of openness and inclusion in society. A major turning point in the democratisation of knowledge was the OpenCourseWare project by the Massachusetts Institute of Technology or MIT in 2002. The goal of this initiative was to put all of MIT’s courses online to the public for free. This ignited the open educational resources or OER movement and marked a significant milestone in making high-quality higher learning freely available to anyone in the world. Today, there are numerous self-education platforms offering a variety of resources in a variety of formats on a multitude of subjects that are open and free to anyone, such as Khan Academy, Coursera, edX, Udacity and FutureLearn, among others. These platforms represent the convergence of technological innovation, democratic principles and the desire of humans to continually learn and create. As with the development of public libraries and universal basic education, open education represents a new stage in the evolution of mass learning. Knowledge is a powerful force for self-determination and liberation. History shows that the tide of history favours freedom, learning and human progress. Open education is used to complement traditional tertiary education and it adds another element to the diverse mix of educational opportunities available to people. Today, digital technologies, and the internet in particular, have compressed the dimensions of time and space so much that anyone with a smartphone now has access to much of the world’s knowledge in the palm of her or his hand. Of course, access alone is not a sufficient condition for lifelong learning, but it is a necessary one. Therefore, it comes as no surprise that most countries have accepted universal primary and secondary education as a human right and an increasing number of countries are beginning to recognise lifelong-lifewide learning as a human right as well. Within this context open education has become an important element for strengthening democracy. Patrick Blessinger is an adjunct associate professor of education at St John’s University in New York City, United States, and chief research scientist for the International Higher Education Teaching and Learning Association.